Henley’s winning draw against Burnham meant the league leaders widened the gap at the top. Despite failing to fully capitalise on results elsewhere, Henley’s winning draw against Burnham meant the league leaders widened the gap at the top of the Home Counties Premier Cricket League to 20 points. With Gurveer Singh back to his best, bagging an impressive seven wicket haul, Henley will be eager to carry their momentum forward into the remaining timed fixtures, which will entail three of their toughest tests so far this season. In recent years, the wicket at Burnham has proven to be a good cricket wicket, offering something for both batsmen and bowlers. However, Saturday marked a return to the Burnham wickets of old, offering drastic amounts of spin and often dangerous levels of bounce, almost from the outset. Having won the toss, Henley skipper Roberts elected to bat, looking to get first use on a wicket which would rapidly deteriorate. Due to a few persistent rain showers, it took until after lunch for Roberts and the returning Jack Davies to get Henley’s now reduced innings of 50 overs off to a good start, epitomising the application and conservative strategy required in such tricky conditions. 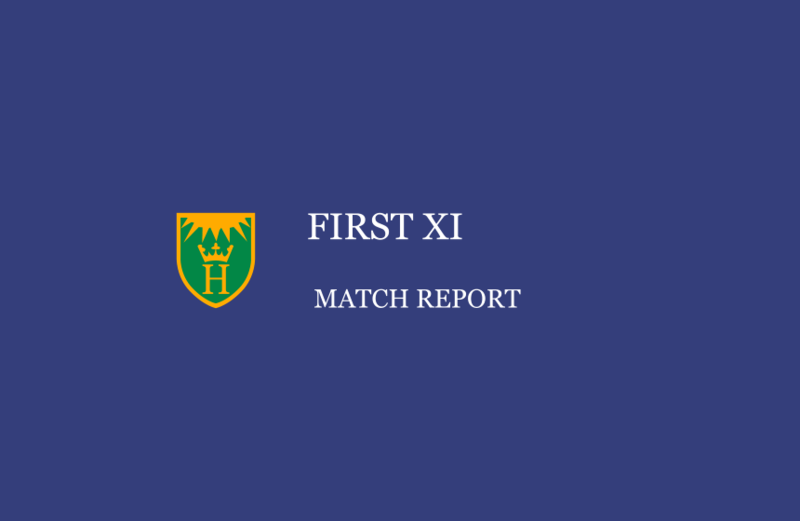 Both players were forthright in defence against some useful new-ball bowling, but showed good intent when the opportunity arose, with Roberts particularly ruthless on anything slightly overpitched. The introduction of spin revealed the dangers ahead however, and after having reached an efficient 44, Roberts miss-timed a pull off spinner Khan, finding Basra at midwicket. Hussain joined Davies with the score on 60-1, the latter showing plenty of character despite not being at his fluent best, and both began to build another strong partnership together. However five overs later, Davies unfortunately miss-timed a drive to a ball which popped off the wicket, looping a simple catch to point, leaving Henley on 89-2. Hussain continued to play with confidence, mixing patience with power, whilst Woods assumed the accumulating role, happy to occupy the crease in the knowledge that a huge score wasn’t going to define Henley’s innings. Woods continued to persevere despite losing Hussain for an impressive 47, the latter adjudged LBW to the off-spin of Burnham captain Gandam. Barnes’ introduction added increased impetus, perhaps the only batter on the day to make the wicket seem relatively placid, bringing Henley up to just shy of 150 before being bowled by Khan for 17. Davison and Woods then took the innings to a conclusion, with Woods out on the penultimate ball of the innings for a crucial 35, helping Henley post an above-par 172. This left Henley with 42 overs to bowl Burnham out, a task which would prove just out of reach despite the away side’s best efforts. After a brief burst from Henley’s pace attack, it soon became clear that spin was the way forward for the foreseeable future, leaving Nugent and Afridi to save their skills for another day. The introduction of Singh and Woods paid dividends straight away, with the latter accounting for Ali on the stroke of tea, skying a ball which was well-caught by Hussain at square-leg. On the resumption of play, it didn’t take long for Singh to get in on the act, dismissing Raja, Basra and the dangerous Khan in relatively quick succession with the help of some brilliant Henley catching. And once Singh had captain Gandam expertly held by Woods at slip for a well-compiled 43, Burnham were reeling on 94-5 with 14 overs left of their innings. Both Woods and Singh were finding plenty of turn and bounce, causing plenty of challenges for Davison behind the sticks. However, Henley’s keeper was more than a match for the task, stumping Javed a few overs later off the bowling of Woods, after Singh dismissed his namesake in the previous over, caught by Davies at point. Burnham then lost wickets eight and nine in quick succession, with bowler Haroon stumped by Davison and Malik caught easily by Roberts at short cover, both off the bowling of Singh. This left Henley with eight overs to find the final Burnham wicket and despite their best efforts, neither Singh nor Woods could put a halt to Burnham’s rearguard action. This was lead principally by Karun Kumar, a top order batter in his own right, demoted down the order due to poor form. Both he and Burnham’s number eleven showed great resolve and with a few pieces of good fortune, managed to steer Burnham to a hard-earned draw after a nerve-racking final over from Afridi.